We recently caught up with The Rod Glove Pro Staff, M J Deroche, who was able to tell us what it's like to be a co-angler in the larger tournaments such as the Bassmaster Opens and FLW Costa series. Many times when we think of competitive tournament angling, we automatically think of the angler, the one that owns the boat, the motor, the trailer and the electronics. Most people assume that co-angler's are there because they don't have the knowledge and many times the co-angler's are overlooked. Mike started fishing with his Dad, who was a full-time Firefighter, just like himself, and his Uncle when he was a little boy. Growing up in Louisana there were many kids fishing derbies and tournaments in which he enjoyed the competitive side of fishing. Just like his Father influenced his career, his Uncle influenced his fishing career as his Uncle had competed in the Top 150 Series. Following in his footsteps, Mike decided in 2009 when the Bassmaster Opens came to his hometown to enter. Although he did not place, he learnt a great deal and had fun. He was so inspired from the event that he decided to start his own Saltwater Series as he enjoyed saltwater fishing. Hours of hard work did not produce the event as that year was when the tragic BP Horizon blew up in the Gulf of Mexico off the coast of Louisiana and shut down the fishing industry. MJ made the choice that day to get back to his roots of freshwater fishing and returned to the Bassmaster Opens. Mike has been using The Rod Gloves for a number of years and says it makes it easier for him to carry his rods from his truck to the boat. Once he gets to the boat, he take the Rod Gloves off, folds them in half and secures them together with The Rod Wrapz and keeps them in a container. 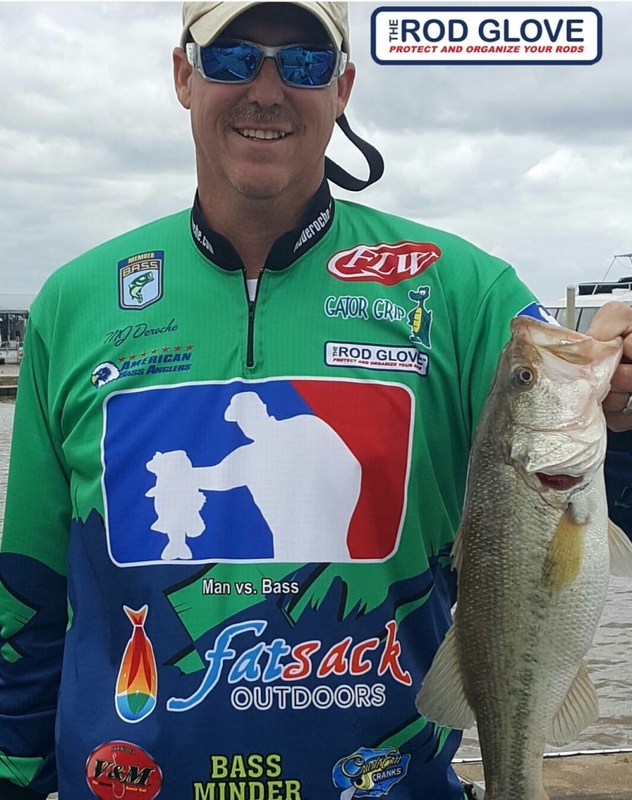 The BFL Series is a division of the FLW tournament series and MJ is in mid-season with the tournament series now. Once the BFL Series finishes he will fish some local charity events. He said that it's a nice feeling to donate back to a great cause while doing something that he enjoys. MJ started using The Rod Glove and Rod Glove Wrapz after he moved his 40 rod and reels in a hurry. He had scooped them up and threw them in the truck and it took him 3 days to unravel the mess. He now uses these products for travel and storage.